With two weeks until the midterm elections in which his party's control of Congress is at stake, President Trump has introduced a new rallying cry on the campaign trial -- the promise of a new middle-class tax cut to be considered by Congress. 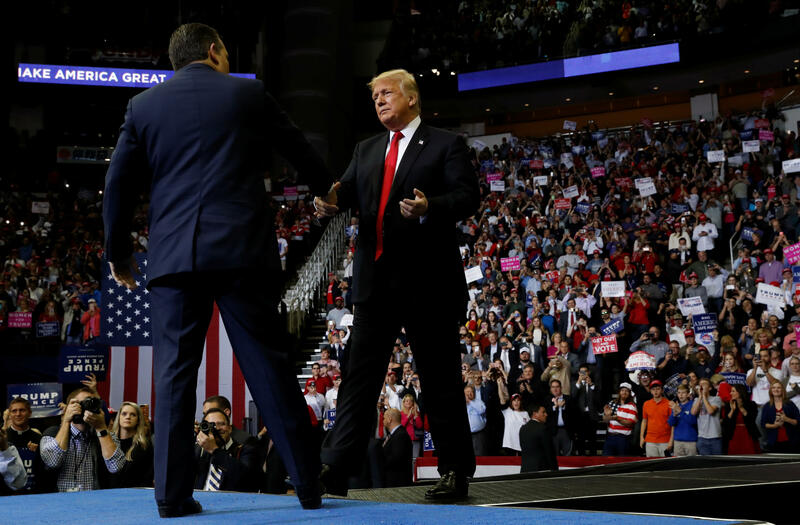 "We are going to be putting in a 10 percent tax cut for middle income families," the president said at a rally Monday night in Texas for Ted Cruz's re-election campaign. "It's going to be put in next week. Ten percent tax cut. Kevin Brady is working on it. We have been working on it for a few months. That is in addition to the big tax cuts you have already gotten." His first mention of a new tax cut came over the weekend, when he told reporters after a rally in Nevada that "we are studying very deeply right now round-the-clock a major tax cut for middle income people," adding that it would happen sometime before November. Since then, he has continued to stress the tax plans in comments with reporters and in political rallies. On Monday, when told Congress was on recess, Mr. Trump said that the tax cut would happen after the election. But neither the president nor his Republican allies on Capitol Hill have offered details of this plan, and Congress' focus has shifted to its battle over which party will control the House of Representatives and Senate for the remainder of the president's first term. Late Tuesday afternoon, the chairman of the House's tax writing committee, Rep. Kevin Brady, R-Texas, released a statement with vague language that only committed to working to develop such a tax cut. "We will continue to work with the White House and Treasury over the coming weeks to develop an additional 10 percent tax cut focused specifically on middle-class families and workers, to be advanced as Republicans retain the House and Senate," his statement said. The 2017 tax law is the central Republican legislative accomplishment that candidates -- and the president -- are highlighting ahead of the elections. The law, which took effect at the beginning of 2018, cut taxes for corporations and wealthy Americans. The $1.5 trillion package also provided smaller tax cuts for middle and low income people and families. In that law, the tax cuts for individuals would expire after 2025. Leaving the White House for Texas on Monday, Mr. Trump stressed that this was not a business proposal. "We're doing it now for middle-income people. This is not for business. This is for the middle." Republicans have already tried to push through another tax cut before hitting the campaign trial, pressing a bill in the House of Representatives that would expand the law by making permanent the individual and small-business tax cuts. The bill did not get the same reception in the Senate, where Republicans hold a very slim majority. Mr. Trump said over the weekend he wanted to move forward with the plan "sometime around" or before Nov. 1. Congress out of session through the Nov. 6 elections. The Treasury Department released numbers last week that showed the federal budget deficit rose to $779 billion in fiscal year 2018, amid a decline in corporate tax revenues. Republicans continue to say that the tax cut will ultimately pay for itself by improving the economy. Rebecca Kaplan and Ed O'Keefe contributed to this report.